Social networking is huge on the internet these days. Seems like Facebook and Twitter are everywhere. 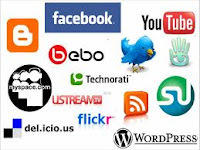 I'm a computer guy so of course am am familiar with these sites and have been since early on, but I have never been a fan of the social media. Maybe because I am not a social person in real life so it does not translate to the internet. I value privacy. I don't necessarily want everyone to know every little thing I do. However you can't deny the benefits of these sites when it comes to connecting with people. There are other ways to utilize these sites as well such as marketing and promotion. You are able to see what people are talking about and what they want. You can promote products to specific audiences using these sites. You can spread content like viral videos through this medium very easily. Right now the new product buzzing is Google+. It's suppose to be like the new Facebook. I don't really use Facebook and I'm not that interested in trying Google+. When they make it public, I might check it out, but like I said before, social networking does not interest me. I am still surprised at how popular Twitter has become. To me it is one of those products that just caught on when it really shouldn't have. I see twitter as basically an email newsletter that you can sign up for, except it is much more limited. We already had this ability in the form of email. Twitter just got the media buzzing about it and people started signing up for it. It became one of those things where people thought they had to sign up for it to be with the "in crowd" Really it is not much different than technology that already existed. Those are just some of my thoughts on social networking today. If you have any comments leave them below.